To help spread awareness for its new application, Burger King has entered the smartphone retail market. On its website, potential buyers can purchase a mid-level smartphone for free on-contract, but don’t expect to see any top tier units. As of right now, Burger King is pretty limited in its phone selection, which includes the Galaxy S4, One (E8), G3 Vigor, One Remix, and LG G2. The phones are available on-contract through a couple of US carriers, including Verizon and Sprint. 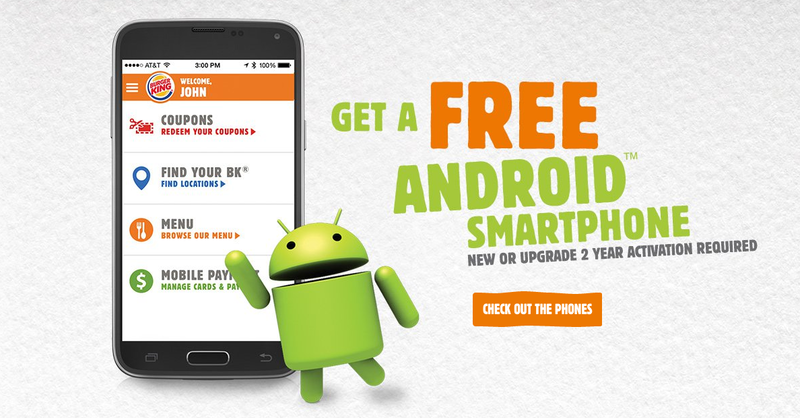 To celebrate the release of the new BURGER KING App for Android we have a FREE Android smartphone offer. Pick a phone, with a new or upgrade 2 year activation and start redeeming your offers in the BURGER KING App. Interesting move on Burger King’s part, no doubt. The only question is, can I get fries with that?